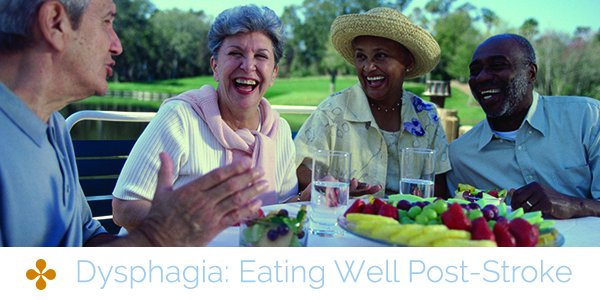 Dysphagia is difficulty swallowing. Because swallowing is initiated by a command from the brain to the esophagus, this neurological connection can be damaged from stroke. Swallowing liquids and solids may take longer than usual and, in some cases, can be painful. Sufferers often complain of the sensation of food feeling stuck in their throats, as well as frequent heartburn. Beyond discomfort, Dysphagia can put sufferers at risk of malnutrition, dehydration, and respiratory complications. Sit upright with head level or tilted slightly forward. Cut food into small, manageable pieces that will help you chew and swallow easier. Keep a meal diary noting what you ate, which strategies you tried, and how enjoyable or difficult it was. Avoid speaking while eating; focus on chewing, swallowing, and clearing airway. Avoid nuts, popcorn, crackers, and cornbread, as their consistency is often hard or painful to swallow. Avoid dry chia seeds– while they carry many health benefits like high fiber and protein content, they can absorb water and expand up to 27 times their dry size. This makes them a particular swallowing hazard for those dealing with Dysphagia. Avoid alcohol, tobacco, caffeine, and other strong or acidic substances that may make heartburn and discomfort worse. These are general suggestions; your medical team should plan a specific meal program for you. Consult your physician before making any changes to your diet. An Aperion Care speech therapist may be able to help you with dysphagia or language problems following a stroke. Find and contact your nearest Aperion Care facility to learn more.